The Bulldogs get their third Top 10 battle of the season in this SEC East-West showdown. LSU quarterback Zach Mettenberger who originally committed to Georgia, returns. Mettenberger, who had an extremely inconsistent first year as starter last season has been quietly one of the most improved quarterbacks in the nation. The senior has thrown for 1,026 yards and 10 touchdowns this season, throwing the ball to two fantastic receivers in Odell Beckham and Jarvis Landry. For a Georgia defense that has proven it will struggle against explosive offenses like Clemson that is a definite issue. Though LSU's defense won't have an easy job either. QB Aaron Murray and backs Todd Gurley and Keith Marshall give the Bulldogs a dangerous offense. In order for LSU to win, they need Mettenberger to play the way he did against Auburn and TCU and the defense must contain Georgia's offense. Though this LSU team is a lot different than past teams; they are faster and can score meaning Georgia could fall to 2-2.
to Michigan and Oklahoma is undefeated but hasn't beaten anyone significant. 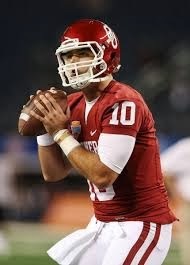 Oklahoma will use junior QB Blake Bell who accounted for 413 yards and four touchdowns in a dominant win over Tulsa. But, this Notre Dame defense is dominant, not as good as last year's, but still very good. It is led by end Stephon Tuitt and cornerback Bennett Jackson who had a big interception in their win over Purdue. Meanwhile, the Fighting Irish offense has some explosive playmakers led by powerful back Cam McDaniel and extremely improved Tommy Rees. The Sooners' defense has some questions; although the stats look great it is still weak against the run and has some holes all across it. Oklahoma just hasn't played any yet to prove that they will be able to beat the Fighting Irish. When the Tide beat Texas A&M at Kyle Field the general assumption was that the only real obstacle standing in their way of a third straight national championship is the SEC Championship. That is wrong as this Ole Miss team could well complete one of the biggest upsets of the year. The up-tempo Ole Miss attack is led by junior quarterback Bo Wallace, senior Jeff Scott and two explosive receivers in Donte Moncrief and true freshman Laquon Treadwell. Alabama's defense has proven it can be beat by explosive offenses like the Aggies. Although it includes a number of All-Americans from linebacker C.J. Mosley and Trey DePriest and defensive back Vinnie Sunseri it can be shredded, especially by dual threat quarterbacks, which the Rebels possess in Wallace. In order for the Tide to beat Ole Miss their offense must also perform. A.J. McCarron can win big games and has turned into one of the nation's best quarterbacks. Their ground game must be great, like it was against Texas A&M in order to beat a sneaky Ole Miss squad. It will and the Tide will come away with a 4-0 mark after this one though it may be a closer game than people think. The Big Ten race takes an interesting turn in this one as the Badgers, who are eager to prove they are better than their 3-1 record, which they don't deserve and the Buckeyes are trying to prove they are still a national title threat. Amazingly, Ohio State doesn't know who their quarterback will be this week. That would be crazy to many people when the year began but that is how good backup Kenny Guiton has been in Braxton Miller's absence. Whoever starts will engineer an explosive offense that includes a number of different playmakers. But, can the defense which has played average this year, stop Melvin Gordon and the power attack the Badgers run? Gordon is extremely explosive while senior James White dominates in between the tackles. Plus, sophomore QB Joel Stave has been great this year and the defense has been solid. If the Buckeyes can find any way to stop Wisconsin's offense they should win this one easily. But that is easier said than done. OSU pulls away with his one thanks to a dominant showing by Miller/Guiton.